Some cosmologists speculate that black holes end their lives by transforming into their exact opposite — so-called 'white holes' that pour all the material they gobbled up back into space. A new theory based on quantum gravity could explain how this is possible. Black holes form when a dying star collapses under its own weight. The resulting spherical surface, known as the event horizon, obscures the object from the outside because nothing can escape its gravitational pull. Some physicists believe that at some stage during this process, quantum-gravity effects take over, preventing collapse and avoiding infinities. The theory suggests that the transition from black hole to white hole would take place right after the initial formation of the black hole, but because gravity dilates time, outside observers would see the black hole lasting billions or trillions of years or more, depending on its size. If the authors are correct, tiny black holes that formed during the very early history of the Universe would now be ready to pop off like firecrackers and might be detected as high-energy cosmic rays or other radiation. 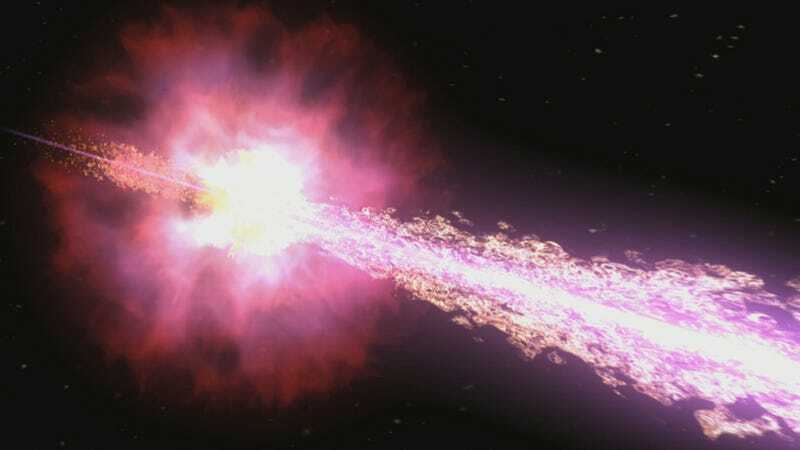 In fact, they say, their work could imply that some of the dramatic flares commonly considered to be supernova explosions could in fact be the dying throes of tiny black holes that formed shortly after the Big Bang. The collapsing star would reach a stage at which its inside can shrink no further, because the loops cannot be compressed into anything smaller, and in fact they would exert an outward pressure that theorists call a quantum bounce, transforming a black hole into a white hole. Rather than being shrouded by a true, eternal event horizon, the event would be concealed by a temporary 'apparent horizon', says Rovelli. If correct, the theory could shed insights into how information escapes from a black hole. As the writers themselves note in their study, "This scenario alters radically the discussion on the black hole information puzzle." It's important to note, however, that all of this is tremendously speculative. The researchers admit that some of their conclusions have yet to be fleshed out with detailed calculations. Other physicists argue that the scenario involves quantum effects that are too large. Read the entire article at Nature News. And check out the study at the arXiv pre-print archive: "Black hole fireworks: quantum-gravity effects outside the horizon spark black to white hole tunneling".